DALLAS, Sept. 8, 2017 — More than forty-two years ago, Chili’s® Grill & Bar changed the food industry and helped introduce a way of eating – casual dining. Guests could enjoy burgers and margaritas while dining out in a fun, casual environment. Over the years, like many bar and grill chains, Chili’s chased consumer trends, expanded the menu and tried to be all things to all Guests, therefore compromising execution and resulting in a fuzzy food reputation. 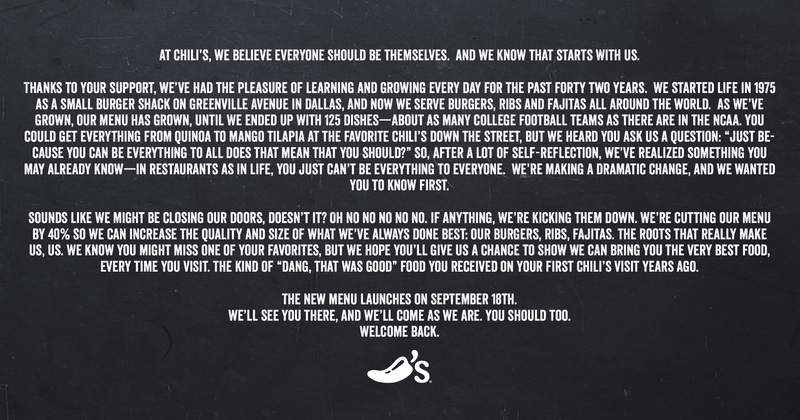 On Sept.18, Chili’s is going back to its roots. The brand will cut its menu by 40 percent and invest millions to improve the food quality and value of its core menu items that first made the brand famous – burgers, ribs and fajitas. Chili’s opened its first restaurant on the corner of Greenville Avenue in Dallas in 1975. Back then, the restaurant was known as a burger shack with 25 menu items, beer and margaritas included. In 1986, Chili’s popularized an emerging dish called fajitas (the menus at that time spelled out how to pronounce the dish: “fa-heet-ah”). From there, Chili’s taught Americans how to sing about baby back ribs. But, as the popularity of bar and grill restaurants expanded, so did the Chili’s menu. In Jan. 2017, the menu peaked with 125 appetizers, entrees, desserts, cocktails and add-ons, including sections devoted to burritos, enchiladas and flatbreads, with ingredients ranging from cauliflower to quinoa, making it one of the largest chain restaurant menus. That’s when Chili’s decided to take the bold step of slashing the menu by 40 percent and reinvesting in the core items that have been the foundation of the brands’ broad appeal for decades. The result is a 75 item, “less is more” menu, which will be available at all Chili’s restaurants nationwide on Sept. 18. 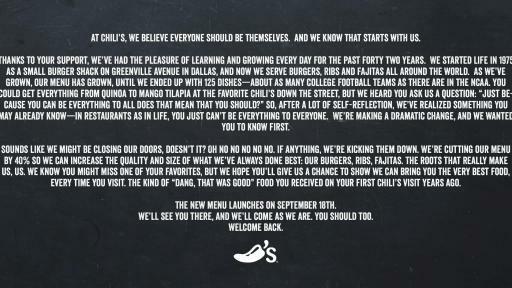 Over the next week, Chili’s will share more about what’s going away and what’s new. Guests are encouraged to follow the company on Facebook, Twitter and Instagram to find out more.